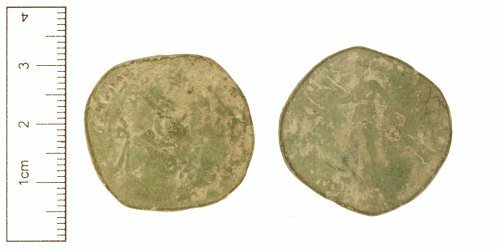 A copper-alloy Roman sestertius of Commodus (AD 180-192), probably dating to the period c.AD 186-187 (Reece period 9). Probably [VIRTVTI AVG P M TR P XII IMP VIII COS V P P, S C] reverse type depicting Virtus standing left holding Victory(?) and leaning on shield(? ), spear on left arm? Mint of Rome. Cf. RIC III, p. 424, no. 505. Die axis is 6 o'clock. Reverse description: Virtus standing left holding Victory(?) and leaning on shield(? ), spear on left arm?